Kiana will take you on a magical 3 day/ 2 night adventure, stopping in at the top destinations along the way. 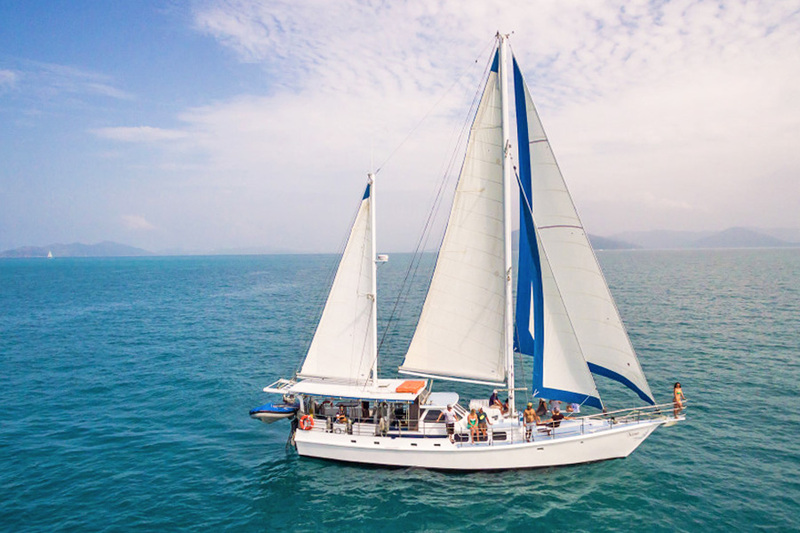 With just 14 guests onboard, you can really enjoy the personalised snorkelling and diving opportunities at the Whitsunday islands and the Great Barrier Reef, whether you are experienced or a first time diver. Back on deck, Kiana provides plenty of treats including the comfort of airconditioning, large saloon areas and cosy cabins (including private twin cabins). Kiana let's you do it all! Traveling on board Kiana, you will get to enjoy the best of both worlds! You will have the chance to explore the Whitsunday Islands through activities such as sailing, snorkelling, diving, and bush-walking, visiting the icons of the Whitsundays such as Whitehaven Beach, as well as a cruise to the Outer Barrier Reef, some 2-3 hours beyond the islands. Dinner: Spaghetti Bolognaise served with Garlic Bread. Please note this is a sample menu and is subject to change and amendments. Upon checking in, Whitsunday Sailing Adventures will provide you with a souvenir environmental bag to pack your belongings in for the sailing trip. They ask that you only take these bags on board with you as luggage. Ensure you pack clothes, a hat, swim-wear, beach towel, shower towel, sunscreen 30+, warm pullover for the evenings (seasonal) and cash for on board purchases. Please note this vessel has cash only. Kiana is fully licensed vessel, so all alcohol is to be purchased from the licensed bar on board - NO BYO allowed on board. PLEASE NOTE: You will be given a luggage bag to take your carry on luggage on to the boat. The vessel will not accept guests to bring their own luggage on board. Scuba diving is an additional cost after first FREE dive - all diving can be decided on and paid for on board. Please note dives are subject to age, weather, other conditions and the dive instructors discretion. High quality above and underwater photo DVD available for $35 each. Your safety in the water is our primary concern. To ensure your comfort and safety divers must be 18 years or over (if 12 years or older may be able to dive with parents consent) and they may require that you have a Divers Medical Certificate for certain medical conditions and also if you are over 45 years old and not certified for diving. Scuba diving is optional and dive fees are payable onboard (age and medical status dependent). To enable us to meet our duty of care and establish an acceptable level of risk, EACH passenger must have a clear understanding of safety directions and instructions given in English by the crew and be able to complete the required safety forms in English. A passenger is only able to participate in water activities if they have a level of swimming experience. If a passenger is unable to swim they will still be able to participate in the sailing trip, but will not but able to participate in water activities such as snorkelling. In order to meet our minimum safety standards passengers must be able exit the vessel unassisted in the unlikely case of an emergency.